UberUber is rolling out changes so you can the total ride price upfront. If there’s surge, Uber adds a line about fares being higher due to increased demand. Nobody likes to be told they’re paying more than the regular price. Uber seems to have gotten the message. Starting on Thursday, consumers who order an Uber ride will no longer see the infamous “surge” rate — the premium Uber charges above its normal rate when demand for rides exceeds the number of drivers available. 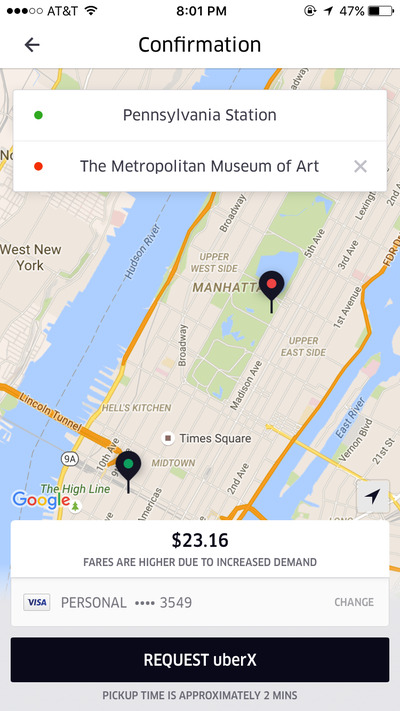 Instead, Uber will show consumers the total price as soon as they order a ride. The Uber app will calculate before you accept how much it costs to get from point A to point B based on the distance, time, traffic and the surge pricing. If the price ends up higher than the typical fare, then Uber will note that it was increased due to demand, but not by how much. The change means that you’ll have to type your destination into the app before the ride from now on. Uber says showing the upfront fare will make its pricing easier to understand. By showing one price for the ride, consumers don’t have to do any maths to estimate how much extra they will pay because of, say, a 1.7X surge. And there wont’ be any surprises when they see the final bill. Uber has been testing upfront pricing in six US cities and five cities in India since April. So far, the company says riders find the pricing easier to understand and are more likely to return to using the service. The company also uses upfront pricing for its UberPool service, which lets different people share an Uber ride. With the update, Uber is also doing away with the lightning bolts to indicate that it’s surging and there’s no longer an option to be notified when the surge comes down either. Uber has had trouble with riders and surge pricing in the past. New Year’s Eve is notorious for riders agreeing to high surge prices without realising that a 3.5x ride means they will end up with a $215 bill. Uber has tried to curb the surprises by making riders confirm the higher surge multiples before taking a ride, but even then, riders have been caught off guard. The latest change makes it clear to riders before they get in what they’re going to be paying, even if they won’t know how much more expensive it is than a normal ride.